Photo courtesy of Scott McIntyre. The release of Rasmussen's first post North Carolina Senate GOP primary survey reminded me of Nate Cohn's New York Times article from last week, titled 'Why The Democrats Turnout Problem Is Worst In North Carolina.' The piece provided some useful information pertaining to North Carolina voting demographics from the 2010 midterm election, especially considering the fact that no exit poll was conducted in the state that year. For example, per Cohn, the white percentage of the 2010 North Carolina midterm electorate was six points whiter than in 2012 (77% vs. 71%, respectively). The black vote was three points lower than in 2012 (20% vs. 23%), while the '65 years & older' age group was 6 points higher (26% vs. 20%). Naturally, this is all good news for Republicans, as they typically perform stronger with white voters than minorities, and older voters vs younger. In light of the information provided in the New York Times piece, lets consider how the Rasmussen survey results would have differed applying 2010-like race and age statistics. Tillis leads Hagan overall in the survey 45-44%. Among white voters only, his lead grows to 26 points, or 57-31%. For what it's worth, that's a good deal less impressive than Romney's 68-31% advantage over Obama in 2012, when he carried the state overall by two points. Rasmussen also finds that white voters make up 72% of the NC electorate, vs. 77% in 2010. Those numbers are more in line with 2012 style turnout than 2010. So what would Rasmussen have found if survey respondents had been more illustrative of 2010 racial identification (all other findings remaining the same)? What was a virtual tie between Tillis and Hagan becomes...welll...less of a tie. The Republican's lead is still within the four point margin of error, but he does add a bit more distance between himself and the incumbent. A similar occurrence is seen when applying 2010-age identification to the Rasmussen survey. Tillis leads among the oldest of voters, 62-35% (while younger voters spring for Hagan, 46-29%). Rasmussen found just 20% of North Carolina likely voters identifying as being over the age of sixty-five years old, though they made up 26% of the electorate in 2010. How would the Rasmussen results have looked with a larger pool of older voters? Again, not a significant shift, but definite movement in Tillis's direction. The bottom line is that, if you buy Rasmussen's numbers, Tillis is starting the general election against Hagan with an advantage regardless of which electorate - presidential or midterm - shows up. Image on the left is courtesy of Alaskans For Begich TV ad, and highlights the wealthy, mega-donors Koch Brothers support of Republican candidates. Image on the right comes from an anti-Obamacare ad sponsored by Generation Opportunity. 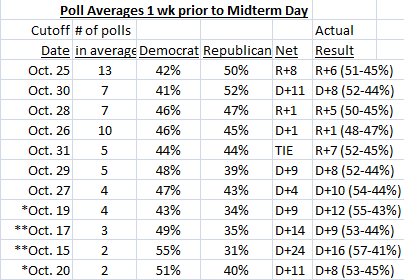 Glancing at the current HuffPollster and RCP polling averages, Democrats and Republicans are essentially tied on the generic House ballot question. The former finds Republicans ahead by less than half-a-percentage point, while the latter finds them down by a roughly equal margin. But don't expect the same polling dynamic that exits today to be present on election day - at least not if past generic House ballot polling dating back to 1970 has anything to do with it. And further, I'd caution against relying too much on the surveys taken in the final week before the election, too, as they've been pretty hit-or-miss themselves. Hundreds of generic ballot surveys taken over the last 45 years and eleven midterms finds polls conducted in the Spring of an election year (April, May, and June) have overstated the eventual Democratic margin in nine of them, or 82% of the time (including the last five midterms in a row). Surveys taken in the final week(s) of a campaign are no exception, understating the Republican margin in eight of eleven elections. 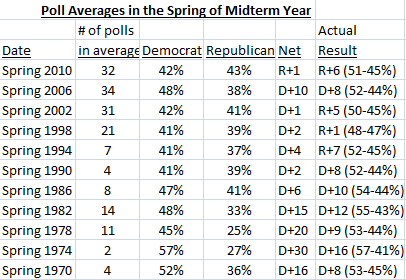 Consider the tables below, the first of which provides polling data in the spring of each midterm since 1970 compared to the final result, the second of which compares polling data taken in the final week(s) of the campaign with the actual result. Polling data pre-2006 was provided by the Roper Center's IPOLL databank. * Indicates the cutoff date for polls to be included in the average was TWO weeks prior to the actual election day. ** Indicates the cutoff date for polls to be included in the average was THREE weeks prior to the actual election day. Dates were only altered if necessary to obtain a large enough sample to average. Surveys conducted in the Spring of the last eleven midterm elections tended to overstate the eventual Democratic margin over Republicans by an average of five net points. Looking at specific elections, such as 2010, you can see Republicans were polling an average 43% in the Spring of that year, though they eventually won 51% of the popular vote. Democrats, meanwhile, were polling an average of 42% that Spring, and wound up with 45% that November. The Republican advantage over Democrats grew from just one point in April, May, and June, to six points in November.